Speaker : Hidenobu Mizuno, Ph.D.
Higher functions of the brain rely on the formation of precise neuronal circuit during development. To understand the process and mechanisms of the circuit formation in living animal, we have been using in vivo two-photon time-lapse imaging technique. We previously found that neuronal dendrites in the mouse cerebral cortex are highly motile during the period of circuit formation. However the molecular mechanisms controlling dendritic dynamics and circuit formation are still largely unknown. By using a novel plasmid vector-based gene silencing system, we have been screening the genes involved in the circuit formation in living animal. During screening, we found a gene which is related with a brain disorder. 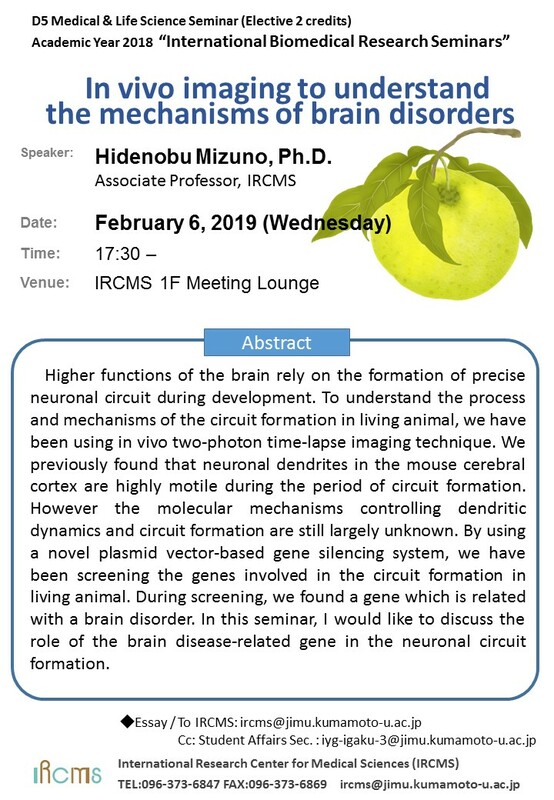 In this seminar, I would like to discuss the role of the brain disease-related gene in the neuronal circuit formation.